The Senate Judiciary Committee report on S. 414 (which eventually became Bayh-Dole) cites the 28,000 patent claim as evidence that the federal government, by providing open access to research inventions made with federal support, has failed to manage these inventions for commercialization, and thus foreign competitors gained access to federally supported research for their own nefarious technology development. Where are we now? US universities, institutes, and foundations hold over 120,000 US utility patents acquired in the Bayh-Dole era, over 50,000 of which are marked as having had federal funding. And universities’ claims to ownership of inventions must exceed 300,000. Most of those patents are unlicensed and the inventions are not legally available for use. Of those patents that are licensed, most are licensed exclusively (often in violation of Bayh-Dole), and most of those that are licensed exclusively have not resulted in commercial products based on the license. Gold is total US utility patents issued to universities, institutes, and foundations. Blue is patents held by the universities and others citing federal funding. There’s no Bayh-Dole effect. If anything, universities have been patenting increasingly more non-federally supported inventions, even as federal funding to universities has increased substantially over time. As for more and more patents, patents represent inventions not available to the public–the gold and blue lines that go up mark increasing suppression of research results. Even if we were to consider licensing of these inventions–universities almost never report actual licensing by invention–an exclusive license also marks suppression of research results. 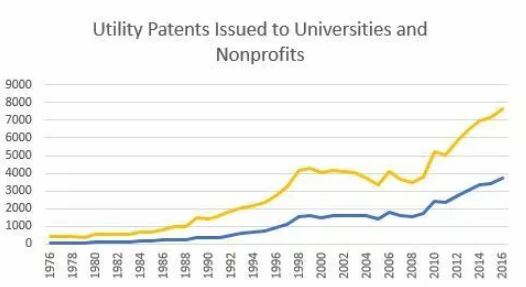 The graph above shows the success of Bayh-Dole in suppressing public access to university-originated inventions. If the goal of Bayh-Dole had been to prevent foreign access to the inventive bits of federally supported research, then Bayh-Dole would have had to require foreign patent applications–either the contractor would have to do that or the federal government would have to. But this hasn’t happened. Bayh-Dole blocks invention use in the US for twenty years, but leaves most inventions freely available to anyone outside the US. Bayh-Dole is one giant turd. If, however, a contractor goes off with open access or non-exclusive licensing, then Bayh-Dole wasn’t needed at all. Bayh-Dole all but mandates that the patent system must be used to create and maintain patent monopolies. If open access truly did suppress commercialization, then this must be true not only for US companies but for all companies. A company in Japan could not possibly want to develop an invention made freely available in the US–if it did, then once it had a successful product, US companies (or any companies anywhere) could simply copy it and cut in on the market without spending the money to develop. Since every company is this rational (ahem), no company could possibly commercialize open access federally funded research inventions. As Forman put it bluntly, “there will be no progress of the arts and sciences.” Forman was talking nonsense, of course, but Bayh-Dole advocates deal in normalized nonsense, so it’s all good. According to the monopoly meme, each invention, to be used and developed, must be placed with a single company that then has the benefit of a patent monopoly. The company must maintain that patent monopoly. If it didn’t, then there would be no point in it receiving the monopoly in the first place. Thus, no other company may have that monopoly or benefit from the use of the invention. All other companies, then, must find ways to avoid using federally funded inventions and avoid the direction of federally funded research, or get there first and render the federal projects useless. That’s the logical reality of the federal government handing out patents to companies based on federal favoritism and requiring the companies to exploit the patent monopolies involved to suppress use and development by others. Bayh-Dole, however, does not move federally supported inventions directly to companies–even if this were the desired goal (and advocates for Bayh-Dole admitted in Congressional testimony that company ownership was the goal but that politically it wasn’t achievable). Instead, Bayh-Dole requires licensing–either by the federal government or by a “middleman” contractor or invention management agent. The purpose of arbitrary contractor management of inventions was not to do open access better than the federal government, but rather to exploit patent monopolies–the “true” purpose of the patent system, according to those that love Bayh-Dole. Funny, I don’t see in the patent system that the “true” purpose of patent law is to disenfranchise inventors in favor of professional middlemen. But clearly, those that love Bayh-Dole believe that patent monopolies are essential and middlemen are better at handling patent monopolies than mere inventors–and are better at choosing themselves to manage inventions than are mere inventors in working directly with companies or in choosing what middlemen they want to work with. Bayh-Dole makes contractor management of inventions arbitrary. That is, it does not matter what the federal objectives might be for any given bit of federally supported research, it does not matter what the university faculty members’ objectives might be, it does not matter the university’s capability with invention management or its track record in licensing or even if it has complied with Bayh-Dole in the past. Bayh-Dole merely states that if a contractor gains ownership of an invention made in federally supported work, the contractor has the right to preempt all federal and faculty objectives for research in favor of exploiting a patent monopoly. If anything, Bayh-Dole undid federal control over strategic inventions made with federal support. Bayh-Dole preempts other law (but for Stevenson-Wydler) with regard to federal agency requirements for ownership of inventions made with federal support. In its place, Bayh-Dole’s own patent rights clause is weak, walked back, may be waived and appealed, and enforcement is delegated to each federal agency, which is not required to enforce anything–and generally then the only enforcement is in the administrative paperwork for show. Never been a march-in, and Bayh-Dole’s implementing march-in procedures were designed not to operate. After Bayh-Dole was passed, nothing much changed. Before Bayh-Dole, universities and nonprofits had the IPA program run by the NIH and the NSF, which provided most of the federal funding going to universities. Under the IPA program, university administrators were required to take ownership of federally supported inventions whenever they decided to patent them. The IPA program was shut down in 1978 for having crappy outcomes. For military work, the Department of Defense permitted contractor companies to own patentable inventions. So Bayh-Dole changed nothing of substance there, either. Bayh-Dole just added more stupid paperwork that obscures what is actually happening. What did change, however, is that university administrators took advantage of Bayh-Dole’s crappy drafting, federal agency non-enforcement, and Bayh-Dole’s secrecy requirements to change university policies. The administrators claimed that the changes were necessary to “comply” with Bayh-Dole. It was just a clever trick. University administrators misrepresented the law–and many still do–and changed university patent policies to take ownership of most any invention they could. The reasoning, such as it is, goes like this. Bayh-Dole requires universities to own federally supported inventions. So we have to change our policy to take ownership of these inventions. Since it’s not clear just how federal support might contribute to any given invention, we have to claim all inventions, even if federal support isn’t obvious and even if the invention might not be patentable–it’s not up to inventors to decide these things. And since university ownership of inventions is a really good thing, it would be unfair to all the other university inventors to leave them owning their inventions–so we should own all inventions. And besides, it would be unworkable to have one university policy for federally supported inventions and another one for everything else. Thus, university administrators changed university patent policies to “comply” with their misrepresentation of Bayh-Dole. Their fraud came to a head in Stanford v Roche, but even when the Supreme Court refuted their claims, they just doubled down. Now many university policies define “invention” to mean “inventions and non-inventions.” “Employee” is defined as “employee and non-employees.” It’s a nonsense world given dignity by attorneys–that is, it takes at least a few hundred thousand dollars to prove in court that university attorneys are wrong. University administrators mock the federal government for the 28,000 (really 26,000) patents the government held in 1976. But they have no shame. They sit on more than 120,000 patents they have acquired in the Bayh-Dole era (some of which, obviously have expired). Unlike the federal government, which provide open access to most of its patent portfolio, the university administrators have suppressed access. They should be ashamed–shocked at what they have done to America. Apparently, though, they have no shame. Any way we look at it, Bayh-Dole is one giant turd. This entry was posted in Bayh-Dole, Bozonet and tagged 28K patents, Bayh-Dole, giant turd. Bookmark the permalink.